Health Minister Isaac Adewole had tweeted that tests by the agency found "no evidence" of plastic material. About 2.5 tonnes of the "plastic" rice has been confiscated. Lagos customs chief Haruna Mamudu said on Wednesday the fake rice was intended to be sold during the festive season but has not commented on the health minister's statement. "We are not done with comprehensive tests. We are still in the laboratory. We haven't concluded analysis and it is not something we can conclude in two days." "We are yet to conclude the chemical and biological analysis," he added. Mr Adewole had said the agency would "release detailed findings to public as soon as it concludes investigations", adding that Nigerians should remain calm. It is not clear where the 102 seized sacks of rice came from but rice made from plastic pellets was found in China last year. Is the rice still on sale in the markets? We haven't heard any reports that the rice is still on sale in markets. Customs officials were investigating but as of now have found nothing. Nigeria's custom officials say they seized a total of 102 sacks, each containing 25kg (55lb), branded "Best Tomato Rice". It is, however, unclear how many bags had been sold, if any, and if there are other forms of contraband in the market. We haven't heard of any members of the public eating it. Customs officials cooked the rice and said that the texture was very gummy and it smelled odd, they refused to eat it. When asked the same question on Twitter, Health Minister Isaac Adewole joked that no, he wouldn't eat it without salt. 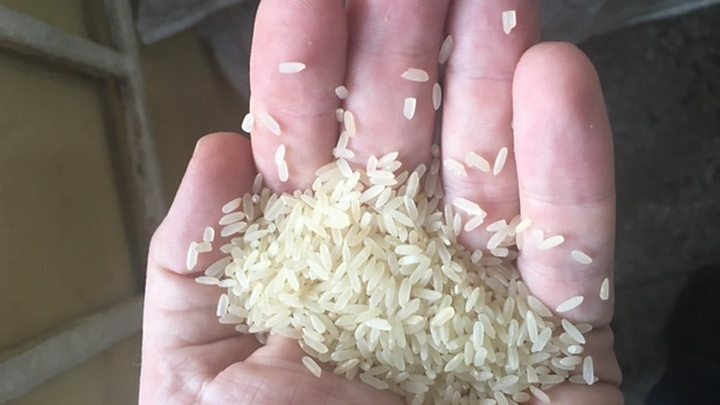 An unverified video of the rice being cooked has been shared on social media. In it the cook says the rice catches fire and sticks on the pan. Very worried. There have been several media reports warning the public about fake foodstuffs especially from China and their potential dangers. Speaking to the BBC's World Have Your Say programme Ibrahim, from Kano State, said selling fake rice was wickedness of the highest order. How could there be such a disagreement between different Nigerian officials? Customs officials did say that they were awaiting tests by Nafdac, the food standard agency, before they could confirm what the rice was made of. They suggested they would accept the results of those tests. However, a customs agent told the BBC that the texture of the rice was like nothing he had seen before. It is possible that this is a different type of rice that they weren't familiar with. It is also possible that the Ministry of Health is making an effort to avoid public hysteria in the run-up to Christmas.